Introducing a Top of the Line Swedish Craftsman's Knife manufactured by Lindblom's Knivar, a Swedish Knife Manufacturer. This larger craftsman's knife, made of a robust heavy Stainless steel, is designed to withstand heavy use. 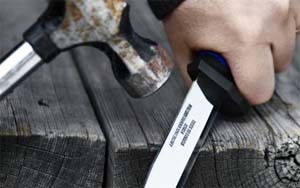 This rugged blade can become your best friend on the job. Engineered to take abuse at work, it can be used to perform a variety of quick actions during your day. The firm grip 3-layer rubber handle is made to last and provides comfort and protection for your fingers.